While the Scriptures testify to the deity of the Messiah Yeshua—that He is, in fact, God in the flesh (see perfectword.org/deity)—they also simultaneously assert the Master’s complete and genuine humanity. Affirming His deity, Yeshua embraced the title “Son of God” (cf. John 5:18, 10:22-39 and 19:7), and occasionally referenced His own divine origins (cf. Matthew 22:42-46; Mark 12:35-37; John 3:13, 6:62), but He most often referred to Himself as the “Son of Man.” Apparently, “Son of Man” is an allusion to Daniel 7:13-14, which Yeshua seems to use as an acknowledgment of His role and calling of Messiah—similar to the meaning behind the title “Son of David.” Though neither of these titles are a direct affirmation of the Master’s humanity, both reinforce His interaction and association with humanity, as well as His sharing in our very nature and experience. John 1:14 says of the Messiah’s physical manifestation, “the Word became flesh.” This is to say that the Word—who was God—became a human being. God supernaturally initiated this uncommon event within the completely common and normal mechanism of human pregnancy (see Matthew 1:18-23, Luke 1:26-38, cf. Isaiah 7:14). Nine months later, Yeshua was “born of a woman” (Galatians 4:4), entering this world in the natural manner of most every other human baby ever conceived. Indeed, the Master’s genealogy confirms His legitimate human ancestry (see Matthew 1:1ff and Luke 3:23ff), further testifying to the reality that He is actually and fully human. Historically, the unique circumstances surrounding Yeshua’s earthly beginnings have brought about speculation concerning His humanity. Complicating the matter are seemingly ambiguous passages such as Philippians 2:6-8, in which Paul says that Yeshua was “found as a man in appearance,” and He was “made in the likeness of men.” Similarly, in Romans 8:3, Paul says Yeshua was “sent… in the likeness of sinful flesh.” From these, some have suggested that Yeshua only appeared to be human, giving rise to the idea that His perceived humanity was somehow different from ours—that He was not exactly like us, having been constructed of some substance other than the same corporeal, “sinful flesh” material. But was the Master Yeshua merely posing as a human being? Was He deliberately misrepresenting Himself as a man in order to obscure His true, super-human nature? On the contrary, not only did the Master appear to be human, He is human—and “in this you [will] know the Spirit of God: every spirit that professes Yeshua Messiah having come in the flesh, it is of God” (1John 4:2). In fact, Paul speaks plainly in several passages, calling Yeshua a “man,” thereby professing to the nature of the Master’s unmitigated and normal humanity. For instance, in 1Corinthians 15:20-22, Paul compares Yeshua to Adam, saying, “For since through man [Adam] came the death, also through man [Yeshua] came the Rising Again of the dead.” According to Paul in Romans 5:14-15, Adam “is a pattern of Him who is coming.” He also says that “the free gift in grace of the one man Yeshua, Messiah, abound[ed] to the many.” Indeed, Paul makes the central role of the Son of Man evident in 1Timothy 2:5-6, “For one is God; one also is [the] mediator of God and of men: the man, Messiah Yeshua, who gave Himself [as] a ransom for all” (cf. Matthew 20:28; Mark 10:45). 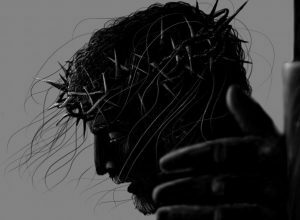 This once-and-for-all payment was made on our behalf through the physical suffering (Matthew 17:12, 26:2; Mark 8:31, 9:12, 9:31, 10:33, 14:41; Luke 9:22, 9:44), sacrificial death (i.e., Romans 5:6-8, 1Corinthians 15:3), and rising again (Matthew 17:9, 20:18; Mark 9:9; Luke 24:7) of a mere, mortal man. In every physical respect, “the man, Messiah Yeshua” was an ordinary human being, even to the point that He could be tempted. In Hebrews 2:14-18, this astounding reality is made perfectly clear. “Seeing, then, [that] the children have shared in flesh and blood, He Himself likewise shared of the same, [so] that through death He might destroy him [who is] having the power of death—that is, the Accuser…. Therefore, it was necessary for Him in all things to be made like the brothers, [so] that He might… make atonement for the sins of the people, for since He suffered, Himself being tempted, He is able to help those who are tempted….” He shared in our flesh and blood; He was made like His brothers in all things; and, yes, He Himself was tempted. It was “necessary” for the Master Yeshua to be a human being because the atonement for sin and destruction of the Accuser required the suffering and death of a man just like every other man! And how did this ordinary human being accomplish such an extraordinary task? Though He was “tempted likewise in all things, [yet He remained] apart from sin” (Hebrews 4:15, cf. 1Peter 2:22, 1John 3:5). The man, who required no sacrifice for His own sin, became an acceptable offering for sin on our behalf—making atonement once and for all (see Romans 8:3, 2Corinthians 5:21, 1Peter 3:18). Truly, it is beyond our ability to comprehend the divine dynamics of the Messiah’s eternal, dual nature as both fully God and fully man. Nevertheless, we should find incredible hope and encouragement in the perfection of the Master’s humanity—realizing that the goal of Messiah is within our reach. We do not have to strive daily in vain to imitate an incorruptible, unmatchable deity. Rather, in “the man, Messiah Yeshua,” we have been given One whose pattern we are actually expected and able to emulate. Indeed, “Messiah also suffered for you, leaving to you [Himself as] an example, that you will follow His steps” (1Peter 2:21). The hope we have in Yeshua is not just that He is fully God in the flesh, nor that He is, in fact, the unique One and Only of God. We should also find hope in His reality as an ordinary, flesh and blood human being, who shared our identical human experience, yet daily leads us in His extraordinary ways. Excellant! Thanx Kevin, you’re right on. Love your insight. Thank you once again Kevin! Right on! And this is not an inconsequential matter. Yeshua WAS tempted in all manner as we. He CHOSE to resist every temptation. Judaism’s Calendar Confusion Listen to "Deny Yourself"